“Inspire people to do actionable items using social media.” Our CrisisCommons Canada team likes to call it Applied Social Media. We create,do stuff…and talk about it. Karen Snider of the Canadian Red Cross and Wendy Harman of the American Red Cross presented their Social Media Case Studies at Social Media Week and the Toronto Social Media Club on February 9, 2011. 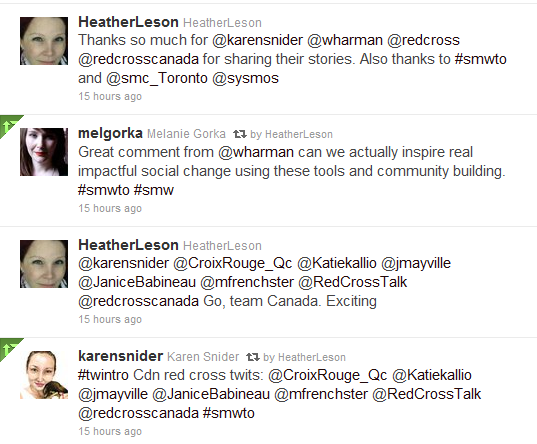 Karen and the Canadian Red Cross team are great supporters of CrisisCommons Canada. We have a common goal of sharing information and digital volunteerism. Karen introduced the new CRC Social Media team that is gearing up to support CRC activities across the country. (Their twitter handles are in the screen capture below.) We are very excited to continue our conversations with CRC and find new ways to collaborate as digital volunteers and partners. 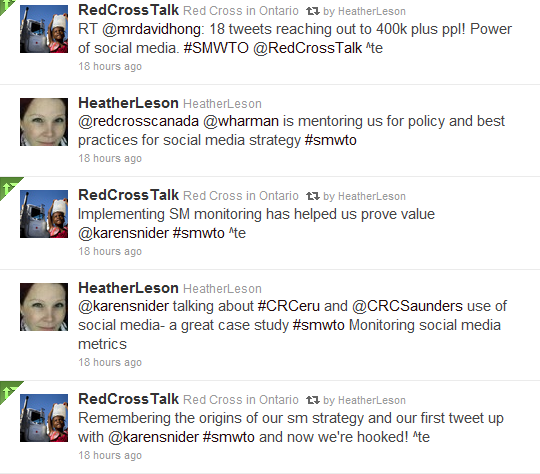 In the past year, the Canadian Red Cross has been testing social media strategy for small projects. More details can be found on the RedCrossTalks Blog. Last night was my first time meeting Wendy Harman in person. She is a leader in SMEM for social good and has inspired me for the past year. The power of the SMEM network is that we built connections online and share many people in common. Wendy created the American Red Cross’s Social Media Strategy Handbook. This is available free online to use and remix. We truly look forward to more SMEM conversations in Canada and with our Amercian friends.